When it comes to low budget horror / slasher / thriller movies, it always helps to have an innovative idea, a single location and good special FX. 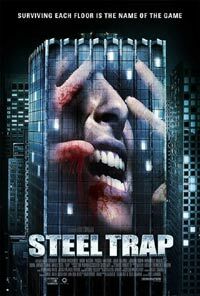 In the case of Steel Trap the idea is okay, the location is certainly central and the FX are alright. A new years party at the top of a deserted high rise office building has a selected few of the party-goers invited by sms to another floor of the building. They include everything from a rock star and a TV cooking show host to a publicist and a womanizer. What looks like a kiddies party and treasure hunt soon turns bloody and deadly as the group gets trapped in a deadly game of hide and seek, with no escape route. Semi-elaborate set-ups and split-timing is naturally on the table. While it goes through the paces, after movies like Saw, revenge plots of this kind are no longer fresh. Even if you do figure out who the killer is, the outcome may leave you bland.